Fort la Latte and Cap Fréhal at the Cote d'Émeraude in the northeast of Brittany don't seem to have something in common at first sight. But it's the "sight", the view, which makes both tourist attractions excetional. Best of all is the footpath alognside the cliffs from Fort la Latte to Cap Fréhal. You walk for an hour on a small trail, on on side steep slopes going down up to 70 metres to the sea, while on the other side brambles grow rampant. Fort La Latte is located about 4 km southwest of Cap Fréhal and about 35 km of Saint-Malo. This impressive castle, or Fort, stands in solitary splendor on a small spit of land at the Baye de la Fresnaye. The house of the mighty Goyon-Matignon built at this sit a castle in the 13th century. In the year 1379 it was conquered by Bertrand du Guesclin. It was besieged by the English in 1490 and by the holy League in 1597. Garangeau under the reign of Louis XIV turned it into a fortress, using Vauban's building plans. They used canon batteries, stationed in Fort La Latte, to defend Saint-Malo against English and Dutch attacks. In the year 1793, a melting furnace for cannon balls was built and some counter-revolutionary suspects were imprisoned at Fort la Latte. The last attack happened in 1815 during the Hundred Days (French Cent-Jours) (also known as the Waterloo Campaign, it describes Napoleons return to power between 20 March 1815 to 28 June 1815), when a few men from Saint-Malo unsuccessfully attacked the castle. It is highly recommended to visit this castle, which is in a very good condition. The view is excellent. In fact, various films have been shot at this site, including "Vikings" (1958 by Richard Fleischer) with Kirk Douglas and Tony Curtis. Fort la Latte was neglected in the 19th century, and 1892 it became private property. In 1925 (or 1931) it was declared a place of historic interest. 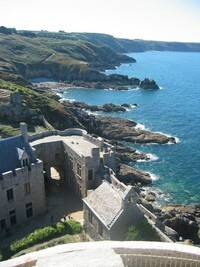 The spit of land, Cap Fréhal, belongs without any doubt to the most beautiful areas of Brittany. Heather and gorse extend as far as the eye can see. 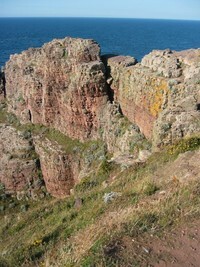 Barren cliffs with reddish sandstone and greyish slate build a pictorial panorama together with the blue and turquoise sea. These cliffs are up to 70 metres high and they seem to fall down nearly perpendicular. 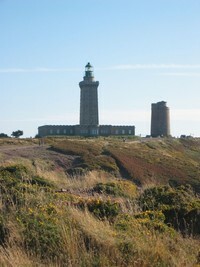 The view from Cap Fréhal is unforgettable: the Pointe de Groin in the east and the Ile de Bréhar in the west. Two lighthoueses are the main attraction of this sport: one from the 17th century built by Vauban and the other one from 1950.